File photo of Michael Obafemi. 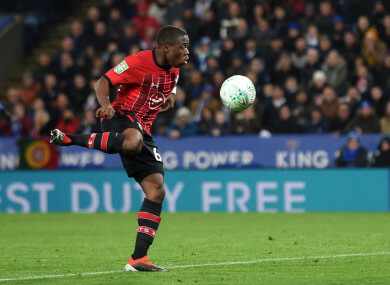 REPUBLIC OF IRELAND striker Michael Obafemi was forced off injured during Southampton’s 2-0 defeat to Arsenal earlier today, having been introduced as a half-time substitute. Obafemi replaced Stuart Armstrong at half-time, but was then forced from the field 20 minutes later with a hamstring injury. The same injury had kept Obafemi on the sidelines for almost two months, his last appearance coming against Huddersfield on 22 December. Saints manager Ralph Hassenhuttl lamented Obafemi’s injury after the game. “I’m very disappointed for Michael’s injury. Both goals came in the opening half, first through Alex Lacazette and then Henrikh Mkhitaryan, and the result leaves Southampton in trouble at the bottom of the league. They are in the relegation zone, one point and a one place from Cardiff City, and the safety of seventeenth place. Email “Irish starlet Obafemi forced off with recurrence of hamstring injury against Arsenal”. Feedback on “Irish starlet Obafemi forced off with recurrence of hamstring injury against Arsenal”.